I was cleaning out the freezer earlier this week when I found a package of turkey wings and legs from a turkey I had made a couple of months ago. I defrosted the package and stripped the meat off the bones. Voila, leftover turkey meat without the whole turkey! 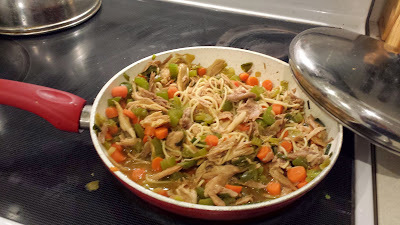 I decided to make a lo mein dish with the turkey shreds. Really easy and yummy! Here at the Frugal Follies household, we are cutting down on carbs, so I only used about 2 ounces of thin spaghetti in the dish. If you want to make the dish go further, add more noodles. Heat the oil in a large skillet over medium-high heat. Add the scallions and cook for 2 minutes. Add the celery, carrots, and peppers in turn, stirring for 2-3 minutes between each addition. In a separate small bowl, combine the chicken stock, ginger, garlic powder, and soy sauce. Add the sauce to the skillet and bring to a boil. Add the turkey meat and stir. Bring the heat down to medium-low, cover the skillet, and cook for 10-15 minutes. In a separate medium saucepan, cook the spaghetti according to package directions. Drain. Add the cornstarch and water to a lidded container. Cover and shake until the cornstarch is dissolved. Uncover the skillet and add the cornstarch/water mixture to the skillet. Turn heat to high and bring to a boil. Cook until the sauce is thickened. Add drained spaghetti to the skillet and stir until the spaghetti is covered in sauce.